The dementors are here! 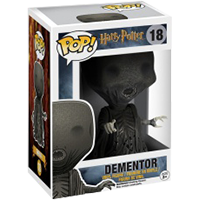 These frightening figures from the Harry Potter universe are ready to serve you and keep any evil wizard from escaping. But always keep a patronus charm at the ready just in case they get out of control! These 9.5 cm figures are masterfully made and quite scary! A Dementor is a non-being and Dark creature, considered one of the foulest to inhabit the world. Dementors feed upon human happiness, and thus cause depression and despair to anyone near them. They can also consume a person's soul, leaving their victims in a permanent vegetative state, and thus are often referred to as "soul-sucking fiends". They are known to leave a person as an 'empty-shell'. There are certain defences one can use against Dementors, specifically the Patronus Charm. Dementors hold no true loyalty, except to whomever can provide them with the most people to feed off. They cannot be destroyed, though their numbers can be limited if the conditions in which they multiply are reduced, implying that they do die off eventually.